As a newcomer to Manhattan, I enjoy public transportation and the ability to hop on a train at any given moment, sit alongside all kinds of people and access any neighborhood. Riding the subway has its ups and downs—its starts and stops—but no matter where I'm going it's always inspiring to see the fantastic public artwork in many of the city's subway stations. 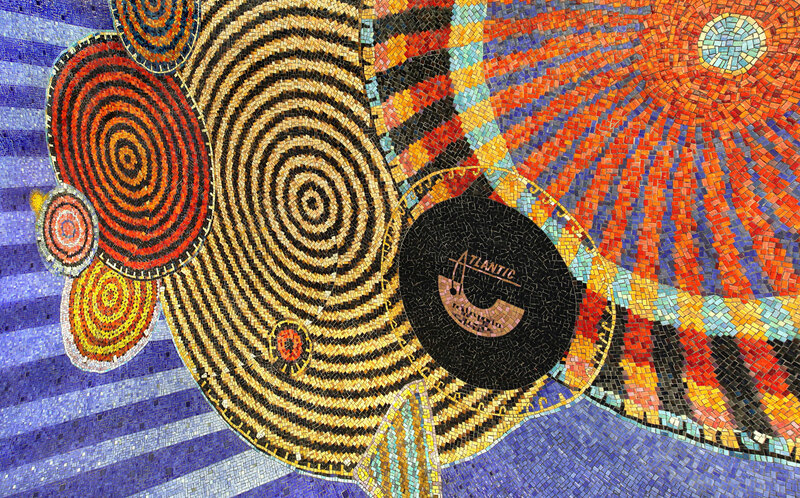 One particularly striking installation, Funktional Vibrations, by 1998–99 Studio Museum artist in residence Xenobia Bailey, is located at the main entrance of the 34th Street – Hudson Yards station on the 7 line. 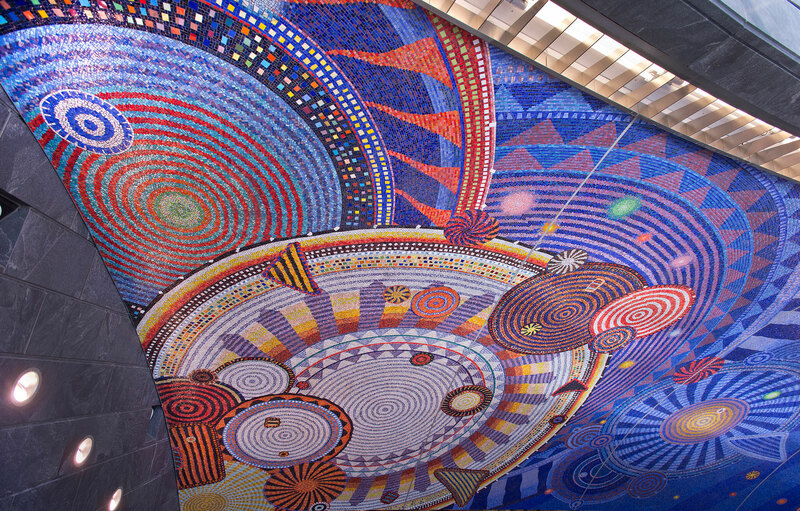 The work, large amosaics of concentric patterns in the curved niches of the station’s ceiling, exudes the same lively energy as the artist’s sculpture. Bailey is known for colorful crocheted hats and tapestries with orb-like patterns like those in Funktional Vibrations. While the colors align, the use of mosaic and installation is a new facet of her practice. 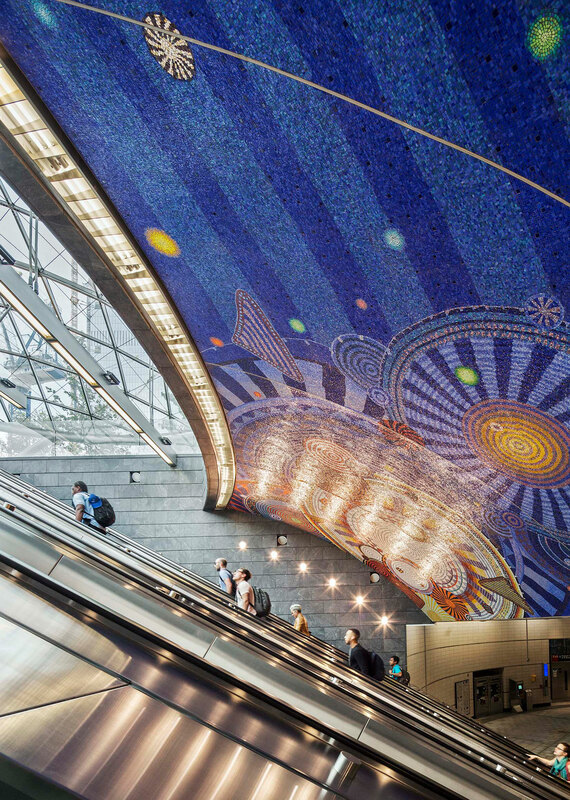 The MTA artworks are large public projects, and according to Lester Burg, Metropolitan Transportation Authority (MTA) Arts and Design Senior Manager, Bailey’s textile practice was what set her apart from other artists. During the final selection process, Bailey pulled out her knitting to show off the vibrant colors she envisioned for her installation. The final work mimics the way yarn |and fabric can blend colors and patterns. Once selected, Bailey chose the fabricator Miotto Mosaic Arts Studio, who use mosaic made in Italy, to assist with the production. In the type of mosaic Bailey created, glass is poured in sections set inversely to the final pattern, then covered with mesh. Once dry, the mesh is pulled off and the sheets are broken apart as puzzle pieces for transport to New York. The glass pieces were assembled on site, with the artist’s input of where and how each panel fit into place. The scale of this work involved collaboration and trust between artist, fabricator and installation team to produce the artist’s vision. In the final product, Bailey’s psychedelic vision comes to life. Beads and metals within the installation capture shifting light at different times of the day, and also reflect the material culture of her environment and her practice of making artwork with found objects. In one part, a record takes shape through the abstracted fragments, a clear indication of the inspiration Bailey takes from the funk music she grew up with during the cultural upheaval of the 1960s. Unlike works in a museum or gallery space, the MTA Arts and Design projects exist in crossover sites that people move through everyday, which provides a new arena in which to appreciate the work of artists such as Bailey.